The early Earth — often called the Hadean Earth by geologists — is a mysterious place. That part of our planet’s history occurred more the 4 billion years ago and virtually nothing from it remains. We only have a few mineral relicts from which we infer a surface of primordial land and seas. Clues to this mysterious epoch can be gleaned from the Earth’s Moon, which was subjected to many of the same geologic processes. 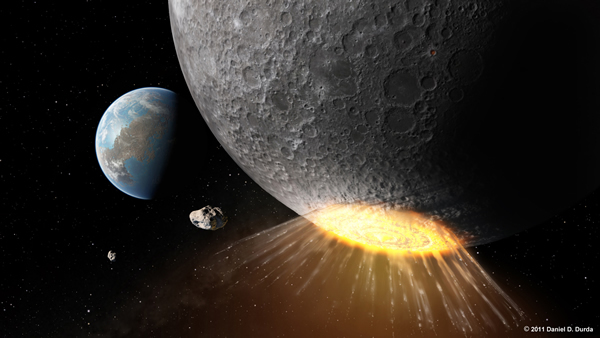 While the Earth’s surface was reshaped by plate tectonics, volcanism, erosion, and other geologic processes, the Moon’s surface was only modestly affected and preserves a record of ancient planetary processes. If one looks up at the Moon, one sees a surface scarred by impact craters. 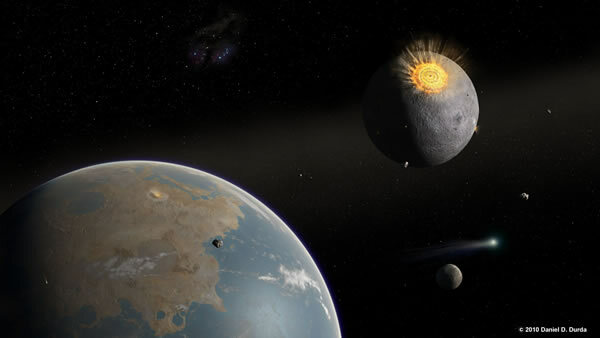 Studies of those craters indicate the largest and most violent among them were produced during the earliest epoch – coincident with Earth’s Hadean. Thus, the Moon indicates the Earth was bombarded by tens of thousands of impacting asteroids and comets, producing a heavily cratered surface. To illustrate that spectacular bombardment, we present two videos. These videos are rendered as (a) animated gif movie, (b) another animated gif movie, and (c) as a combined set of animated gif movies that are embedded within a PowerPoint file. A video of a rotating, impact-scarred Hadean Earth. This is an artistic reconstruction that illustrates land masses, mountain ranges, and seas shaped by impact cratering events, some of which significantly heated portions of the surface. A video showing the accumulation of impact craters as time passed during the Hadean and into the earliest portion of the Archean of Earth history. Video credit for (a) and (b): Dr. Simone Marchi created these videos in support of the following publication: S. Marchi, W. F. Bottke, L. T. Elkins-Tanton, M. Bierhaus, K. Wuennemann, A. Morbidelli, and D. A. Kring (2014) Widespread mixing and burial of Earth’s Hadean crust by asteroid impacts, Nature 511, pp. 578–582. Other illustrations of this period of Earth-Moon history are posted below for download and can also be found in our collection of classroom illustrations. Earth-Moon Impact Basin-Forming Epoch: A view of the Earth-Moon system during the formation of the Serenitatis basin on the Moon is posted in the sub-section Bombardment of Planetary Surfaces in our collection of classroom illustrations. 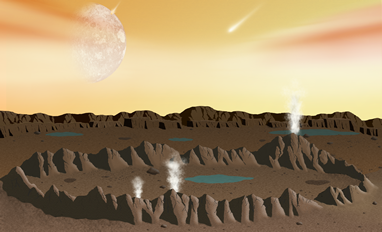 Earth-Moon Impact Basin-Forming Epoch II: A view of the Earth-Moon system during the formation of the Schrodinger impact basin near the end of the basin-forming epoch is posted in the sub-section Bombardment of Planetary Surfaces in our collection of classroom illustrations. 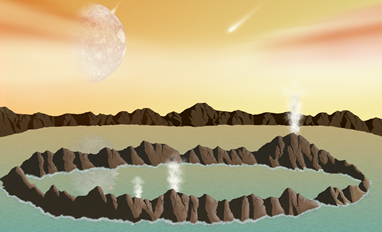 Early Earth Impact Crater Lakes and Hydrothermal Systems: A view of the type of impact crater lake that might have been involved in the early evolution of life on Earth is posted in the sub-section Bombardment of Planetary Surfaces in our collection of classroom illustrations. Early Earth Impact-generated Hydrothermal Systems: A view of the type of impact crater and subsurface hydrothermal system that might have been involved in the early evolution of life on Earth is posted in the sub-section Bombardment of Planetary Surfaces in our collection of classroom illustrations. 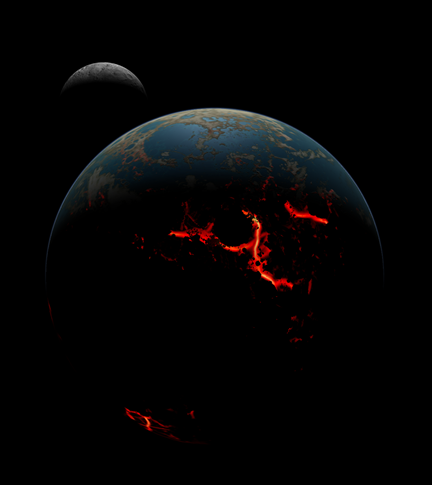 Earth-Moon Distance in the Hadean, Nearly Four Billion Years Ago: In the views (e) and (f) above, the Moon is very large in Earth’s sky. That is because the Moon was closer to Earth during the Hadean. A schematic diagram illustrating the Moon’s proximity to Earth nearly four billion years ago is posted in the sub-section Earth-Moon Dynamics in our collection of classroom illustrations. Earth-Moon Distance soon After the Moon’s Formation: The Moon was incredibly close to the Earth soon after it formed and would have appeared to be an immense fiery ball in Earth’s sky.